Samtavro temple located in Mtskheta is directly linked with deeds of st. Nino, convertor of Georgians. Samtavro temple is the central structure of the Nunnery established here in XIX c. while in earlier times is had been the residence of the Archbishop of Kartli. According to the legend the huge blackberry shrub stood there – the refuge and dwelling place of st. Nino upon her arrival to the capital of the kingdom of Kartli from Capadocia. A small domed chapel was erected on the place where the bush has bloomed. It is rather simple construction with rectangular dome and apse attached from the west. The rubble stone temple had suffered numerous reconstructions (interior is adorned with XIX c. wall painting, reflecting all significant aspects of st. Nino’s early life). Tracing the history of the monastery development is rather complicated task for today. Quite possibly the earliest layers of the temple could be dated back even by IV c.
Christ the Savior temple built in the first half of XI c is the main construction of Samtavro Monastery although doubtless it had incorporated many sections of the earlier building. Even the ruins of early Christian basilica were found beneath its foundation. 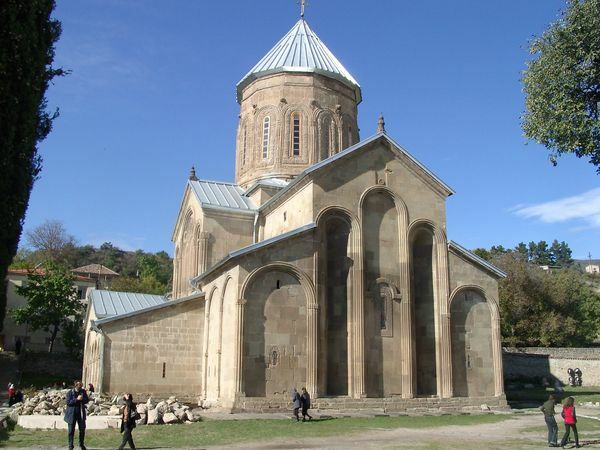 According to the legend the first Christian ruling couple of the Kingdom of Kartli – canonized king Mirian and his spouse queen Nana are buried here. This recorded cross-shaped structure with a pair of free standing dome bearing columns can be regarded as the very first sample of the referred above “canonical” architectural type that had remained constant through the whole history of Georgian church architecture. Two chapels are attached to the building from north and south first of which is earlier and another is contemporaneous to the main building. There is minor porch attached to the church from the west. Although eastern facade of the building adorned with several triangular niches and fife-ribbed arcade is common for the first third of XI c. the southern and northern arm facades have got absolutely unique decoration. In both cases tri-arcade motive is essential for the embellishment. The southern arm is “animated” through the plasticity of small niches, formed by the range of facing stones. with slanting cut, creating multicolor flesh of light and shadow. As for the northern arm its expressiveness is achieved through the tense mixture of floristic-ornamental lines and coils and spools. These absolutely original compositions with neither direct processor nor subsequent samples clearly reveal peculiar gifts of the architect – sculptor. Several other sections of the building also reveal the same trends towards adornment, for instance: in decoration of arches of southern porch and even in the interior of the building, as well as in shaping of windows from the internal side. A stone iconostasis of XV c. adorned with fretwork is still safe. Several fragments of XVII c. wall painting are preserved as well. Some large portions of facing were renewed in XIX c, whilst the dome and its barrel had been restored in XIII-XIV cc. A porch-bell tower of the turn of XV-XVI cc built of neatly hewn stone slabs stands north-westward of the temple. Another construction a round in shape tower erected next to it was apparently built in XVIII c.